The Olympic trials event started today. I don't think there have been any races or anything but the fair is going on, and a ton of people are here. 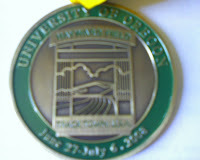 I actually live across from one of the corners to Hayward field where the event is occurring so it is very exciting. My girlfriend and I participated in one of the events that is probably supposed to get visitors to campus to check out the UO. As a result I won this cool "limited edition" medal. For getting a sheet stamped at a few places around campus. Well worth the effort if you ask me.